(Photo: REUTERS / Gary Cameron)U.S. 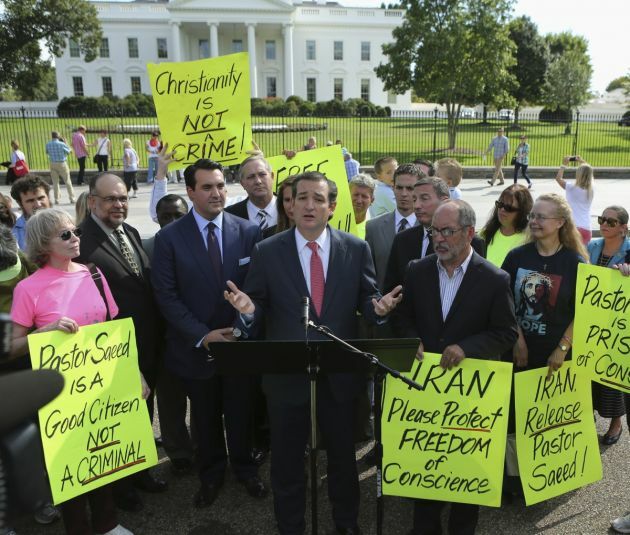 Senator Ted Cruz (R-TX) (C) delivers his remarks with members of the Christian Defense Coalition in front of the White House in Washington September 26, 2013. The event marked the one year anniversary of Saeed Abedini, an Iranian American pastor who is serving eight years in an Iranian prison. A jailed Iranian pastor is facing the death penalty after the government leveled against him a new charge called "spreading corruption on earth" or "Mofsed-e-filarz," in Pharsi. This a capital crime, according to Christian rights activists. Behnam Irani, who was at the helm of a 300-member Church of Iran congregation in Karaj City, 20 kilometers (12 miles) west of Tehran, is currently serving a six-year jail sentence for his Christian activities. He is said to face health problems that include colon complications and severe bleeding due to stomach ulcers. The 41-year-old pastor has been in solitary confinement after allegedly being beaten on June 7 and was supposedly threatened by religious police with further prison time. That was after a magistrate charged the pastor with communicating with media, according to Prison Alert. Christian Solidarity Worldwide said the fresh charges against Irani appeared to be part of a wave of repression under the administration of President Hassan Rouhani targeting religious and ethnic minorities, reported Ucanews.com. The government is said to be concerned about the spread of Christianity in the strict Islamic state, it reported. "We are deeply concerned by the new charges against Pastor Irani, especially the charge of spreading corruption on Earth, which bears unsettling similarities to the one faced by Pastor Matthias," the Foreign Affairs Committee of the National Council Resistance of Iran quoted CWS's chief executive Mervyn Thomas as saying. Thomas was referring to the charge "Moharabeh" or "warring against Allah" that was leveled against another pastor Matthias Haghnejad, which rights activists said can also carry capital punishment. "Such charges are tantamount to an indictment of Christianity itself and mark a renewed escalation in Iran's campaign against Persian Christians under the Rouhani presidency," stated Thomas. Thomas also urged the government to drop the unwarranted charges against the two pastors, along with five Christians it said were unjustly arrested and detained last week for their faith. These actions against Christians are contravene international covenants, to which Iran was a party, that guarantee freedom of religion or belief, he said.